Originally published under the title "Turkey: Death to Free Speech." A criminal indictment was filed against Sedat Ergin (left), editor-in-chief of the country's most influential newspaper, Hurriyet, for allegedly insulting Turkish President Recep Tayyip Erdogan (right). Defending his quest for an executive presidential system Turkish President Recep Tayyip Erdogan cited Hitler's Germany as an effective form of government. Yes, he said, you can have the presidential system in a unitary state as in Hitler's Germany. His office later claimed that the president's "Hitler's Germany" metaphor had been "distorted" by the media. Erdogan's words on Hitler's Germany may or may not have been distorted, but the way he rules Turkey reminds one powerfully of how Hitler ruled the Third Reich. With or without a distortion of Erdogan's words, a criminal indictment was filed against Sedat Ergin, editor-in-chief of the country's most influential newspaper, Hurriyet. 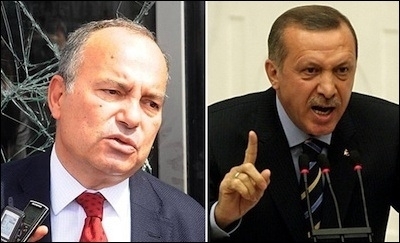 Prosecutors demanded up to five years in prison for Ergin, for allegedly insulting Erdogan. The indictment claims that Hurriyet insulted the president by paraphrasing his Sept. 6, 2015 remarks about an attack by the outlawed Kurdistan Workers' Party (PKK) on the Iraqi border, which killed 16 Turkish soldiers. Such insane charges are no longer news in Erdogan's Turkey. On Jan. 11, prosecutors opened a criminal investigation into the host and the producer of a popular talk show on charges of "terrorist propaganda." The move came after a caller, identifying herself as a schoolteacher, protested the civilian casualties during recent security operations against the PKK. The caller was urging the public to raise its voice against the deaths of "unborn children, babies and mothers." She did not even mention the PKK. 500 journalists were reportedly fired in Turkey last year, while 70 others were subjected to physical violence. According to a report by the Turkish Journalists Association, 500 journalists were fired in Turkey in 2015, while 70 others were subjected to physical violence. Thirty journalists remain in prison, mostly on terrorism charges. Needless to say, the unfortunate journalists invariably are known to be critical of Erdogan. Journalists are not the only ones threatened by a judiciary and law enforcement apparatus staunchly loyal to Erdogan. On Jan. 15, police detained scores of academics whom Erdogan had labeled "dark people" for signing a declaration that denounced military operations against the PKK. Over 1,100 Turkish and 300 foreign academics signed the declaration that Turkish prosecutors think "insulted the state and engaged in terrorist propaganda on behalf of the PKK." Just before the arrests, Erdogan decried the signatories and called on the judiciary to act against the "treachery." "Just because they have titles such as professor, doctor in front of their names does not make them enlightened. These are dark people," Erdogan said. "They are villains and vile because those who side with the villains are villains themselves." In their declaration, these "traitors" said they refused to be "a party to the crime" and called on the government to halt what they called a "massacre." One convicted mafia leader, a notoriously nationalistic man, publicly threatened the signatories that "we will take a shower in their blood." Unlike the "terrorist" academics, he has not so far been indicted for that threat. "For Turkish democracy (whatever that is) this is yet another low. It confirms that this is a 'democracy' with rapidly diminishing freedom of speech. It is 'democracy' where the 'voice of the nation,' which practically is the voice of the political majority and its glorified leader, intimidates and silences dissenting voices," wrote Hurriyet columnist Mustafa Akyol. The Turkish Justice Ministry's statistics perhaps best explain the huge democracy deficit in the Turkey of Erdogan. Turkey's prisons have a total capacity to house 180,176 inmates. As of January 13, Turkey had a total of 179,611 inmates, meaning that there will not be any space if Turkish prosecutors detain just 565 more. 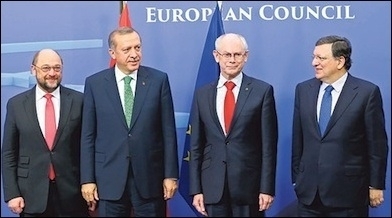 Europe, cherishing its "transactional" relations with Turkey, prefers to look the other way. All of this is happening not in Germany of the late 1930s but in Turkey of the 21st century. Meanwhile, Europe, cherishing its "transactional" relations with Turkey, prefers to look the other way and whistle. All the European Union could say about the prosecution of the academics who signed the declaration was that it is "extremely worrying." Brussels cannot see that Turkish affairs passed the threshold of "extremely worrying" a long time ago. Prominent journalist Can Dundar, who has been in jail on terrorism charges since Nov. 26, was right when he wrote in an open letter to Italy's prime minister, Matteo Renzi, that "the rapprochement between Turkey and the European Union over refugees should not overshadow violations of fundamental rights and freedoms in Turkey during the country's EU accession process." In reality, Turkey's irregularities are too big to be hidden behind the usual diplomatic words such as "concern" and "worrying." Ahead of Turkish Prime Minister Ahmet Davutoglu's meeting in London with Britain's David Cameron, more than two dozen prominent writers, including David Hare, Tom Stoppard, Hari Kunzru, William Boyd, Ali Smith, Sarah Waters and Monica Ali, called on the British prime minister to urge the Turkish government to halt its crackdown on freedom of speech. The English, Welsh and Scottish branches of PEN put it in plain language: "Over the past five months, intimidation, threats and even physical assaults against journalists, writers and publishers have become the norm [in Turkey]." Turkey is now more than "worrying."